Over the next few weeks I’ll use this blog to share some insight into how All Star Video Sports directs, shoots, and edits a baseball recruiting video package and what we do to help players and their parents use the finished video in the recruiting process. I will break down some of the interesting details of how we capture the best video to show off our recruits. We’ll split these blog posts into three sections, fielding, hitting, and pitching. Today, let’s talk about the fielding portion. 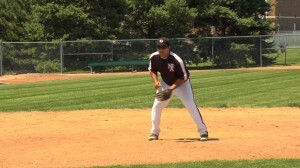 In the fielding section of a recruiting video shoot, traditionally we have one camera following the player in a close up shot, and another camera that shows the same action but from an angle that captures the player’s arm strength and arm slot. We’ll put the player through all the plays needed to play his or her position, whether it’s middle or corner infield, outfield or catcher. The tight shot of the player is focused mainly on form…we’re looking at their footwork, is the player making the correct movements with their feet and arms, are they reading the ball the right way, rounding the ball, are they moving how they are supposed to off the crack of the bat. The shot that follows the player and the player’s throw however is focused on arm strength and accuracy…can they make a good throw to the bag, how strong of an arm does this player have etc. For instance, let’s take a regular third base recruit we are doing a shoot for. With both cameras ready to go, we get shots of him taking multiple ground balls…up the middle, to both sides, slow rollers etc. We get various shots of easy ones and then move on to more difficult plays-it is important to have the variety of these shots in each video to show the player’s versatility. We then would finish up the third baseman’s shoot with a few double play balls and pop-ups. These shots put together make up a standard fielding portion of a baseball recruiting video. Different coaches always have a slightly different answer, but there are some common themes and basics that pretty much every coach wants to see. Our recruiting videos are a culmination of what we’ve learned from these interviews over the years and what we continue to learn by listening.